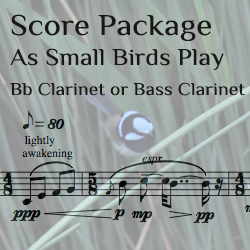 This download package includes the score for solo Bb Clarinet, the score for solo Bass Clarinet, and recorded birdcall sound track for live performance (options include single continuous track or use of two sound cues as per score). Access to the recorded birdcalls will be given via dropbox link after purchase due to file size. Please allow up to 24 hours to receive to the link to birdcall recordings.